Medicine is a continuously evolving field, constantly learning from previous experience and improving. This is all the more true in the wartime trauma environment where resources are limited, conditions are austere, and time is either too short or too long. Our brothers and sisters ashore learned through Viet Nam and the early days of Iraq and Afghanistan that combat injuries will become combat fatalities unless personnel on the scene can stabilize the wounded for treatment by a higher echelon of care. As we consider a return to great power conflict and war at sea, our maritime forces should avail themselves of these lessons in order to prevent unnecessary losses of life in future combat. Fast-forward to the mid-1990s when special operation forces (SOF) medical providers began implementing a program known as “Tactical Combat Casualty Care” (TCCC). Their objective was to increase survivability amongst SOF elements by improving the trauma intervention capability and equipment of several, if not all, team members. Specifically, a greater emphasis was placed on controlling bleeding through properly employed tourniquets or hemostatic agents and alleviation of tension pneumothorax through needle decompression. As OIF and OEF repeatedly validated the effectiveness of TCCC in the SOF community, the training proliferated to conventional forces, becoming a cornerstone of modern deployment readiness. Consequently (and alongside other field medicine advances), the rate of service members being killed in action or ultimately dying of wounds is a fraction of previous conflicts. Combat at sea will be somewhat different. For instance, penetrating trauma from discrete projectiles (e.g., bullets) will not be as prevalent as in land warfare, but similar wounds resulting from shrapnel or fragmentation will likely be common. Numerous additional and relevant mechanisms of injury are also possible during a surface combat scenario. Consider detonation of an anti-ship cruise missile close aboard or within the skin of the ship resulting in primary and secondary blast injuries, burns, blunt force trauma, as well as neurologic injuries without other outward signs of injury – all conditions similar to those seen aboard USS Cole.2 Individual crewmembers’ ability to intervene and stabilize some of these cases will no doubt improve survival rates as well as assist in maintaining combat effectiveness. While large deck warships (e.g. CVN, LHD) deploy with embarked top-of-the-line medical teams, the majority of the U.S. fleet does not. Cruisers and destroyers routinely put to sea with a well-trained independent duty corpsman (IDC, aka “Doc”) as the primary provider assisted by 1-2 junior corpsmen and a cadre of stretcher-bearers. LCS medical manning is even more constrained, usually a single IDC aided by a smaller number of stretcher-bearers. This has been an adequate arrangement for steady state surface operations (and the inspection-centric training cycles) of the past 30 years, but will not be sufficient if the fleet finds itself once again in a shooting war. 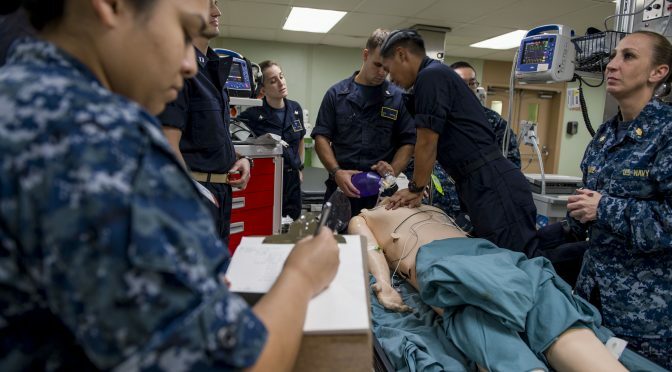 Outside of in-rate training for Corpsmen­ – which has already incorporated trauma lessons from Iraq, Afghanistan, etc.– first aid training aboard surface vessels has yet to advance much beyond U.S. civilian standards of care (basic first aid, CPR, and BLS). These standards do not account for the priority of combat operations over medical treatment, the increased lethality of combat and the shipboard environment, or extended timelines from point of injury to definitive care facilities (factors that led to TCCC’s inception). According to one Chief with extensive expeditionary experience and who has facilitated antiterrorism/ force protection (AT/FP) assessments of East Coast warships over the past three years, “Concepts of direct pressure, pressure points, and proper use of tourniquets are just not a thing out there.” Another Chief was told separately that pressure point manipulation for arterial bleeding was too advanced for shipboard use. Surface force equipage has seen some TCCC-based upgrades in the past few years – better chest seals, hemostatic agents, and cricothyrotomy kits were improvements cited by a current IDC. However, mass casualty stations and first aid boxes are often still filled with antiquated equipment: less effective elastic tourniquets, basic gauze, medical tape, etc. While still helpful, there are better and more efficient tools available in the joint inventory. Additionally, if one were to ask a first tour junior officer or Sailor about an Individual First Aid Kit (IFAK), one might well receive a description of the small boxes commonly found at commercial retailers rather than a vital piece of military kit. These life saving pouches are not a standard-issue item and are often only present aboard vessels whose 1) whose Doc has encountered them (and their importance) elsewhere, and 2) whose discretionary budgets have permitted some quantity of acquisition (e.g. for armed watch standers). What is most beneficial to the surface force, however, is the fact that casualty management is already practiced as part of general quarters, main space fire, or dedicated mass casualty drills. Rest assured, medical providers and corpsmen are thinking about these matters even when the rest of us are not. Additionally, Doc already has that cadre of stretcher-bearers who have been given an introduction to treating injuries, and there is already a system of pre-staged equipment outside of sickbay. These factors provide a ready-made infrastructure for the surface force to improve on. The current medical manning construct aboard small deck warships has been adequate for non-combat operations in the post-Cold War era. The force is well-positioned to stabilize the occasional industrial traumas that can occur aboard vessels, or to manage larger groups of minor injuries. Since the 1990s, true tests of our readiness to simultaneously manage trauma and combat have been blessedly few: Cole in 2000 and Firebolt in 2004. Even then, both events were instantaneous and permitted crews to address medical emergencies without having to continue combat operations. That is an unlikely luxury during a strait transit actively contested by small boat swarms, or an open ocean patrol under enemy missile, torpedo, or gun attacks. The most fundamental change brought by TCCC was the universal carriage of an IFAK along with the training to use its contents. The kit itself contains the basic material to control traumatic bleeding, decompress a tension pneumothorax, and otherwise stabilize the service member until better care arrives or they are medically evacuated. The training aspect of this cannot be emphasized enough: classroom introduction to principles and equipment followed by periodic drills under varying levels of stress. 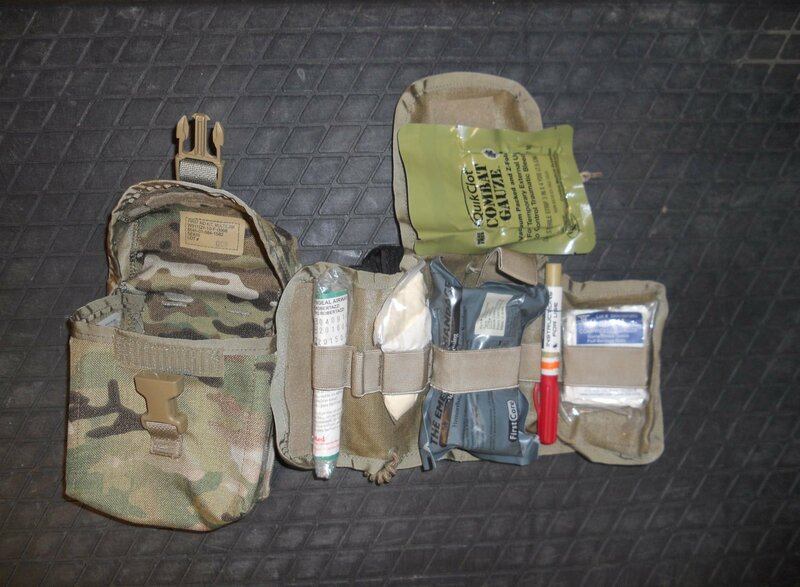 Every Sailor afloat should don an IFAK with their general quarters kit, and be practiced on its use under stressful circumstances – i.e., loud, difficult, and strenuous– as part of combat drills. In addition to IFAKs and training for the entire crew, the fleet needs to upgrade stretcher-bearer training from basic first aid to contemporary TCCC standards. Numerous curricula are already available to the fleet as well as training aids that have been developed through years of preparing ground troops. Similarly, mass casualty boxes and aid stations should be standardized with contents that will enable these TCCC-trained stretcher-bearers to implement the training they received. In deference to the different wound mechanisms likely to be seen in maritime combat, burn care supplies (e.g., Waterjel) should figure prominently in these kits. What if the missiles fired in the Red Sea at Mason, Nitze, and Ponce had found their mark? Those reported Silkworm variants carry 300-500kg warheads. Would we instead be discussing a case study in TCCC rather than a recommendation? 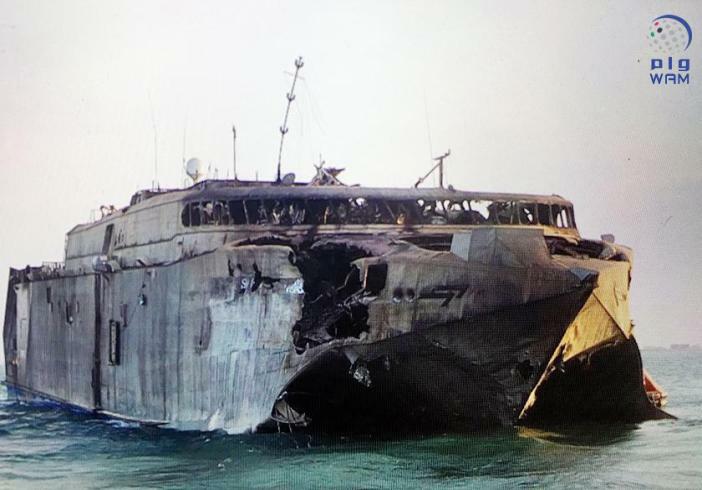 A smaller successor, the C-802 (160-300kg warhead), had recently struck the Swift while in service with the Emirati Navy and although casualty reports were minimal to none, photos of the damage (note the destroyed pilot house) make that assertion unlikely. It took collisions aboard Fitzgerald and McCain to give traction to problems long known to surface warriors and re-order some priorities. We do not need to suffer another such tragedy in order to update our ability to manage combat trauma at sea. Time will always be in short supply, thus prioritization is paramount in preparing crews to go to war. If we are returning to an emphasis on maritime warfighting, then we must be competent at more than just navigation and engineering. Like damage control, TCCC and other individual combat skills should be regarded as fundamental aspects of modern naval service – one more way in which we equip the man (and woman) rather than just man the equipment. The training, tools, and resources for TCCC are already available through the Navy’s medical and logistics systems, the surface force need only take heed of it. Alan Cummings graduated from Jacksonville University with a BS in Physics. He served previously as a surface warfare officer aboard a destroyer, embedded with a USMC infantry battalion, and as a Riverine Detachment OIC. He is currently stationed as an intelligence officer at U.S. Southern Command The views expressed here are his own and in no way reflect the official position of the U.S. Navy, Department of Defense, or any agency of the U.S. Government.